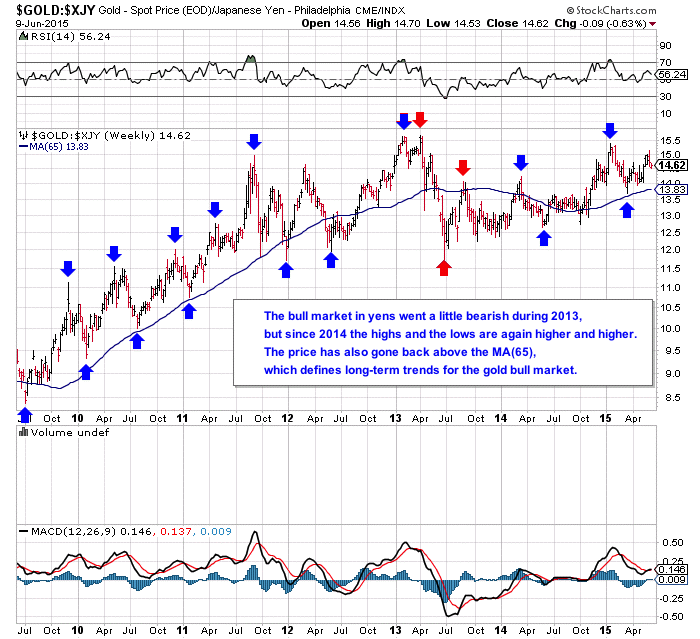 The gold market has been in a profound lethargy (at least in dollar terms) for over a year. This is as frustrating for the bulls as it is for the bears. 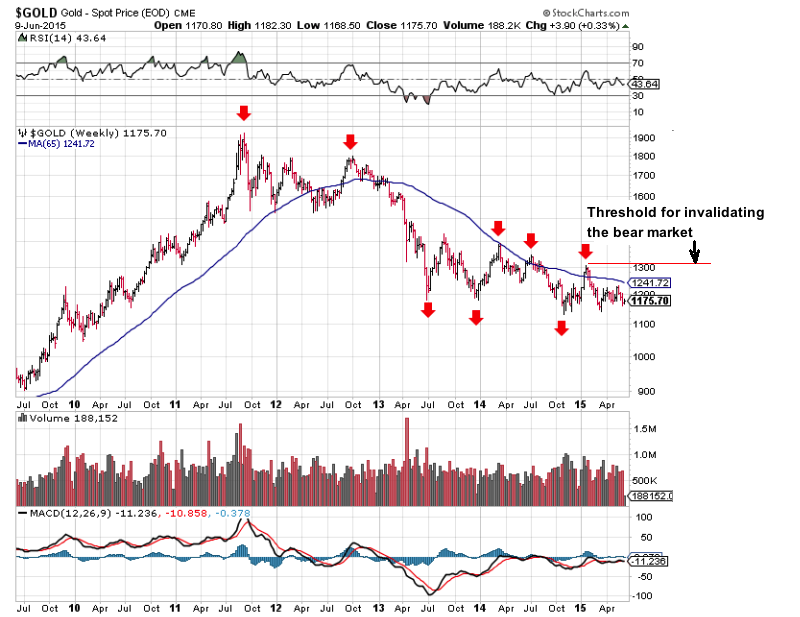 These days we are witnessing an avalanche of bearish commentaries on the price of gold for the coming 6 to 12 months. The psychological $1,000 threshold is attracting analysts like a magnet attracts iron dust, just because an almost four-year old trend ends up drawing everybody in it! Harry Dent (the one predicting gold at $700) is now being joined by many long-time bugs who are seeing gold plummet toward $1,000-$900... before it takes off to $5,000! I call this the final capitulation of the analysts. They are throwing the towel on this frustrating sector and their short- and mid-term predictions end up being dictated by their negative emotions. We can see in the next three following charts that a bear market is defined by constant higher highs and lower lows. 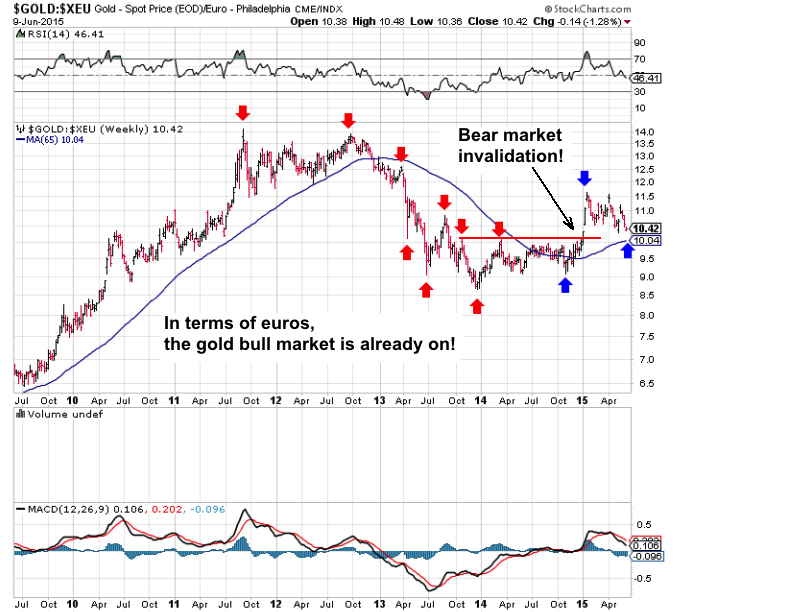 When this process ends, the bear market has stopped and a new trend can take place, as is the case actually with the gold price in terms of euros. With this currency, we’ve had to wait until 2005 for the gold bull market to be validated. Since then, the gold bull market has been validated in all currencies. The actual lull won’t last the same time for all the currencies. As long as gold doesn’t rise above $1,310, technical analysts will remain bearish on the gold price in terms of dollars. The euro being actually much weaker than the dollar, it helped start the gold bull market sooner. But, ultimately, we will see the gold price rise again in all currencies. I feel the same negative emotions as all the analysts and all gold investors, because we are all following this war between gold and the dollar day after day and we’d all like to see gold coming out the winner in the final battle. At this moment, one has to admit that gold is not doing too well in terms of dollars. If I were to give any advice based on my emotions, I’d say that I’m not satisfied with the gold price in this currency, with the pathetic performance of the gold miners, and that I’m not optimistic on the short term. But when everyone is starting to bet on gold and gold mining companies to go down, including the pro-gold analysts, I tell myself that we’re once again very close to a major turning point in this market. And this would only confirm the restart of the gold bull market in euros and yens! In 2011, everyone was bullish and was seeing gold reaching $2,000, even $2,500 before the next major correction. In 2015, everyone is bearish and is seeing gold plunging to $1,000, $900 or even $700 before it can really rebound. Fear is palpable in this market. Analysts, instead of advising to fill the truck at these overly depressed levels, are recommending hopping on the selling wagon to surf on the “final devastation” of this market. Is this sound advice? Have you ever wondered why so few commentators and analysts shout “buy” when a sector is totally depressed and on the verge of starting a spectacular bull market? And why so few shout “sell” when a sector is hyper optimistic and just about to reach its decade-long peak (just like stocks at this moment)? It is because the price evolution during the years preceding this event keeps them from doing it! Because time has played against them. The preceding bull or bear market ended up winning over most analysts who were predicting a trend reversal. They can’t continue to fight this market, because they’ve lost all their credibility, some capital, and are about to lose all of their clients! They capitulate. They are forced to side with the trend even if fundamentals are screaming to the contrary. It is said that a financial bubble first brings ruin to those who bet against it, and then to those who feed it. This change of attitude among long-time pro-gold commentators and analysts is an important sign of capitulation, the kind of sign that is expected before a definitive trend reversal. 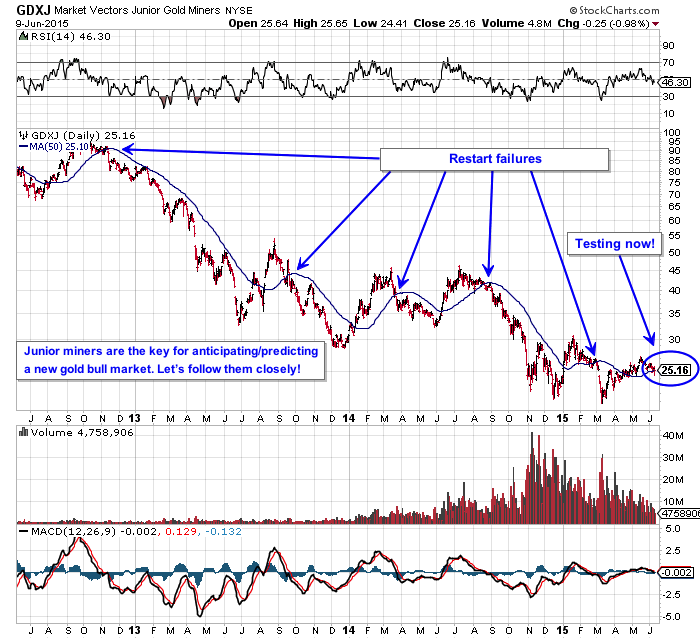 For the moment, if we refer to the “power of prediction” of the junior miners (GDXJ) for the future trend for gold in terms of dollars, we are again testing the 50-day moving average, and the result of this test should give us the short- and mid-term trend for the metal (6-month horizon). For the last few months, the junior miners have resisted astonishingly well to the metal’s weakness, and this is a very encouraging sign for things to come.